This album could have been credited to Tom Pacheco & The Band, as it is the cooperation between the singer/songwriter and the band with a capitol B that makes this album successfull. Pacheco can be labeled as a "friend of Norway", because of his work with Steinar Albrigtsen and his Norwegian record contract. 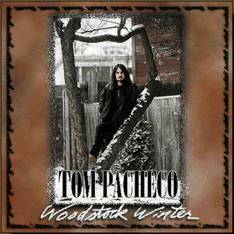 But this album is recorded in Levon Helm's studio in Woodstock, New York, where Pacheco himself lived for seven years. It's been a long time since Pacheco has released such excitingly arranged music (created together with producer and guitarist Jim Weider). The backing is dominated by the new members of the Band, and Weider's copying of Robbie Robertson's guitar sound in certain songs are bordering on theft. Randy Ciarlante's drums and Richard Bell's acoustic piano are often in front, while the contributions of Levon Helm, Garth Hudson, and Rick Danko are limited to a few guest appearances. The songs from Pacheco's bottomless well are better than in a long time, the lyrics are strictly narrative, and his voice is just as ragged and loose as it should be. See also Chris and Gail Bell's review of Woodstock Winter. The Band's pianoplayer Richard Bell also played on the excellent Tom Pacheco/Sharon Alexander album Pacheco and Alexander from 1971 (Columbia 30509). No other Banders were on it, but all of the other members from the Full Tilt Boogie Band, and most of the musicians from the Bobby Charles LP (Jim Colegrove, Billy Mundi, and others) were involved. The cover photo on Woodstock Winter is taken by the Band's photographer Elliott Landy. 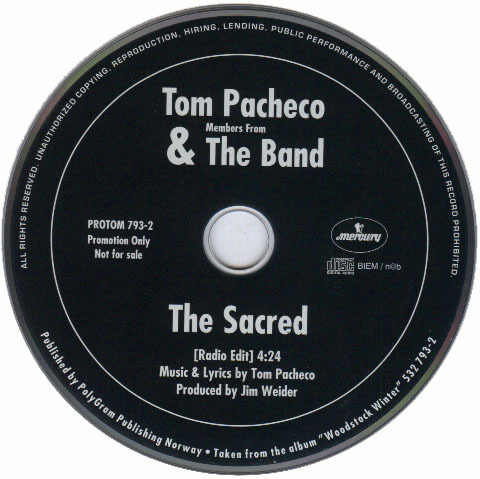 The song "The Sacred" was released by Polygram Publishing Norway as a promotional CD single (57K) credited to "Tom Pacheco & The Band."